The yeti is without question not Bigfoot. It may have been the partner in a hybrid that produced Bigfoot. DNA work does presently support such a possibility, but not strongly enough to be definitive. This opens the door to a far more dangerous creature than Bigfoot has proven to be. Cultural source also confirm this. This attack reads like something I would expect from a weasel in a hen house. All chickens dead. What is missing here is site evidence in the form of tracks likely because the discovery was made too late. The cut tent was likely someone inside the tent cutting himself out to confront the threat itself. It is also noteworthy that the tongue was missing. After this blood bath, the creature likely ate and soft tissue is always the first choice. Other missing parts are not mentioned that I am aware off. At the same time I do not expect a yeti to be a big meat eater at all anyway. I would be really impressed if a liver was missing. An alternative explanation would be a giant sloth. The actual attack pattern conforms except the bodies were left behind which does not conform. Perhaps in winter such kills are simply left behind until it thaws. The probability of this is very low of course. Investigators baffled by the unexplained and gruesome deaths of Russian college students decades ago have come up with a new suspect, albeit an unlikely one: the Yeti. On February 2, 1959, nine college students climbed the icy slopes of Dyatlov Pass in the Ural Mountains of Russia. They never made it out alive. The students bodies were found with broken ribs and fractured skulls. In one grotesque case, a woman's eyes had been gouged out and her tongue was missing. At the time of the tragedy, investigators cryptically declared the Dyatlov Pass deaths were due to a "compelling natural force," according to a new television documentary reexamining the case. Since the massacre occurred during the Cold War, some have speculated the students were killed by a top secret Soviet weapon. Others claim an indigenous tribe lashed out at the hikers for trespassing. A new documentary, "Russian Yeti: The Killer Lives" airing June 1 on the Discovery Channel explores the remote possibility that a "menk" -- the Russian word for Yeti -- may have been responsible. Considering the existence of the Yeti has never been proven, blaming it for the grisly deaths is a stretch. But there are some strange aspects to the massacre, according to explorer Mike Libecki, the star of the program. For instance, one of the tents was slashed from the inside and some of the victims left their clothing behind in subzero weather. Even stranger to Libecki has been the Russian government's suppression of the autopsy and other reports for 30 years. In order to explore the Yeti theory, Libecki visited Russia to meet with Yeti expert Igor Burtsev of the International Center of Hominology. "He's the world's leading expert on the Russian Yeti," Libecki said on the documentary. "He's dedicated his entire life to search for this creature." 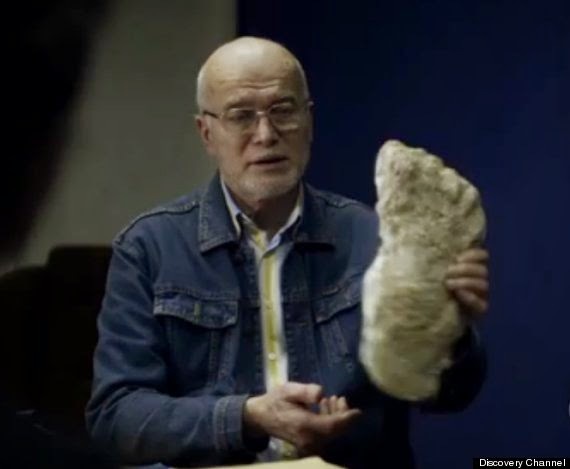 Burtsev, 73, says he has "mountains of evidences" suggesting the creature's existence in the Ural mountains, but "nobody wants to see them." Based on his research, Burtsev says the Russian Yeti is most notable for large feet. "They have bigger foot than the human, and they have short necks, almost without necks," he said on the show. "[The footprints are] everywhere. For last 50 years, I've find signs of Yeti, confirmed by reports of eyewitnesses. They're about 5,000." Libecki is impressed by Burtsev's data. "That's a huge number of sightings for a creature that supposedly doesn't exist," he said. The complete findings won't be announced until the documentary airs Sunday night, but the documentary's title, "Russian Yeti: The Killer Lives," might provide a subtle clue.